Sherri Hill prom and pageant dresses have been worn by pageant winners and prom goers for years. Selina Gomez as well as the famous Kendall & Kylie Jenner girls have been Sherri Hill fashionistas for years. 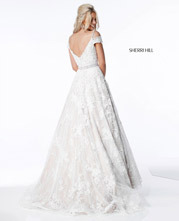 Sherri Hill is an accomplished designer of prom and pageant evening wear. Recent winners and contestants wearing Sherri Hill pageant gowns have included Olivia Culpo Miss Universe as well as Miss USA 2007 Rachel Smith, Miss USA 2006 Tara Conner, Miss America 2007 Lauren Nelson and Miss America 2006 Jennifer Berry. Sadie Robertson of Ducky Dynasty is now the current spokesperson for this popular brand. MTV Video Jockey and Total Request Live host Susie Castillo also won the Miss USA crown wearing a Sherri Hill designed evening gown. Sherri Hill designs can be found on the red carpet as well, most recently on Miss South Carolina Teen USA Caitlin Upton at the MTV Video Music Awards. When you select a Sherri Hill prom dress or pageant gown, you can feel confident that you are going with a winner. If you want to look and feel like a celebrity, shop our exclusive Sherri Hill IN STORE boutique and online exclusive styles that will help you stand out in the crowd. Sherri Hill gowns highlight the seasons hottest styles, red lace, illusion skirts and necklines as well as ruffles and feathers!